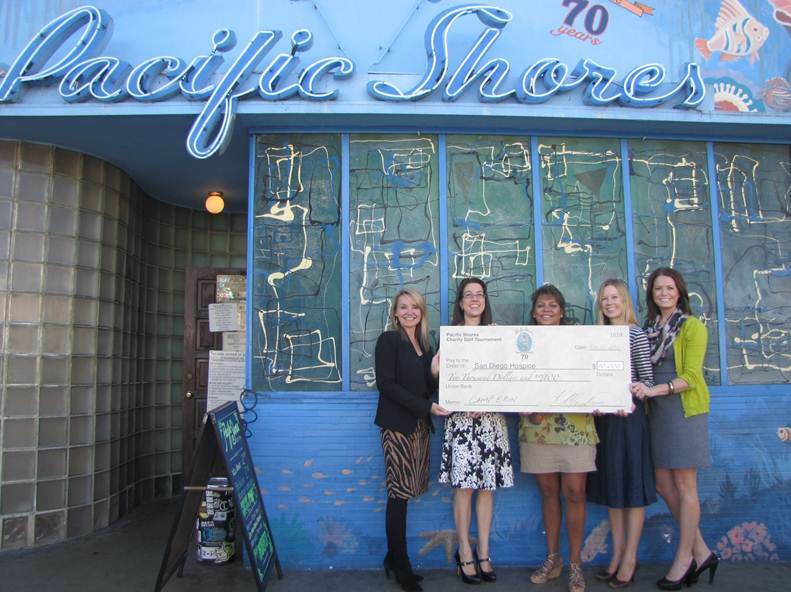 In front of OB’s Pac Shores – Left to right: Traci Bruckner, Chief Development Officer – San Diego Hospice; Kariann Medina, Owner – Pacific Shores Cocktail Lounge; Rita Coronado, Bartender – Pacific Shores Cocktail Lounge; Katie Maxfield, Camp Coordinator – San Diego Hospice; Korie Duke, Annual Program Director – San Diego Hospice. OCEAN BEACH – San Diego Hospice and The Institute for Palliative Medicine was recently presented a check for $10,000 from proceeds raised by Ocean Beach’s legendary Pacific Shores Cocktail Lounge at its 5th Annual Charity Golf Tournament. Held at Riverwalk Golf Club in Mission Valley, nearly 100 golfers played in the charitable event to support the vision and mission of San Diego Hospice. For the second straight year, proceeds from the Pacific Shores 5th Annual Charity Golf Tournament will be designated to support Camp Erin San Diego. The camp is an annual weekend summer camp open to children ages 6-17, who have been impacted by the death of a loved one. This free camp combines traditional, high-energy, fun activities with grief support and education. Camp Erin San Diego is part of a national network of bereavement camps founded by The Moyer Foundation, a non-profit organization established by World Series champion and Major League Baseball All-Star pitcher Jamie Moyer and his wife, Karen, with a mission to help children in distress. Thanks to the success of the tournament, which continues to grow in both terms of participants and funds raised, Pacific Shores plans to host it again in 2013. Last year, over 1.58 million people received hospice care in the United States. Locally, San Diego Hospice cares for 1,000 patients and their loved ones each day throughout the county. San Diego Hospice opened its doors as the first nonprofit hospice in San Diego County back in 1977. Now, the nonprofit organization has grown into the region’s largest and longest-running hospice program. For more information, visit online at www.sdhospice.org or call toll-free 866-688-1600. Join our online communities on Facebook, Twitter, Pinterest, Google+, YouTube and The Caregiver’s Corner blog. This is wonderful to hear. One of my dear friends was able to remain at home due to the care of San Diego Hospice. My mother passed before being assisted by them. This organization is a shining example of why I still trust in the goodness of others! Does anybody know the story on bartender Ruth, a long time bartender who passed away from cancer? And was she assisted by SD Hospice? Also, does anybody know what happened to the midday bartender (Ted? bulky guy, beard with glasses)? Is he still around? Also has anybody heard from Joe the bartender from the old Arizona Cafe? I know the Bar Pink as owners has two alumni of Pacific Shores. Older Article: Rules! What Are They Good For?